Picture a very crowded, overheated boxing ring. In one corner, Apple, Google, Facebook, Microsoft, Cisco and other technology titans are pressing the Federal Communications Commission to clear a path for a deluge of new super-fast Wi-Fi apps and social media content over America's next-generation 5G internet. In the other corner is the entire energy sector, which is represented by its powerful Washington lobbying shops including the Edison Electric Institute, American Public Power Association, National Rural Electric Cooperative Association, American Petroleum Institute, American Water Works Association and Utilities Technology Council. At the center of the ring is a noisy fight for control of wireless spectrum that the electricity industry says is absolutely critical for communications if a natural disaster knocks out a substation or hackers breach the grid. The 2-year-old dispute has slowed an FCC plan to open the gates to Wi-Fi competition across the energy industry band. And it's complicated the Trump administration's full-steam-ahead policy, which frames 5G technology as the way to lock down economic supremacy over China. For utilities, signal interference resulting from a free-for-all among companies offering more ways to stream video could degrade the band enough to shut down communications. Call it a choice between "Black Panther" and blackouts, from their perspective. FCC initiated the confrontation by seeking comment on a proposal to open up prime space on the high-frequency radio spectrum in the 6-gigahertz (GHz) range for future unlicensed Wi-Fi competition. "When it comes to 5G, it's imperative that we remain at the front of the pack," FCC Chairman Ajit Pai said. At a White House 5G conference in September, National Economic Council Director Larry Kudlow saluted the commission's "5G Fast" plan. "Let it rip," Kudlow said. But if the energy industry's warnings are right, the FCC's initiative runs counter to another mission of national importance — defending critical infrastructure against potential natural disasters and cyberattacks, and restoring electricity and water to people if the worst should happen. The president's National Infrastructure Advisory Council — local officials and senior executives who run utilities and other critical U.S. infrastructure — has urged regulators to create "separate, secure communications networks" and reserve spectrum for backup communications during emergencies. "There is no such thing as being cyber secure," said Rob Schwartz, president of telecom company pdvWireless. "It's levels of how secure you can make it. And one of the essential components that often gets lost is that a private communications network is critical to doing so — to having the command and control of that network." The window for comments to FCC closed last month, and now the decision on how to proceed is up to the commission. "The FCC has been hearing from Google and Microsoft and Qualcomm and others that they're being squeezed: They need more spectrum for their businesses," explained Joy Ditto, chief executive of the Utilities Technology Council. "They say 6 GHz would be ideal. We all like to download stuff. This is very much an FCC mindset." With an implicit dig at the FCC commissioners, Ditto told a congressional panel last year that regulators "lack the understanding" of how utilities use wireless communications and the electric reliability policies they're governed by. Our members have said they cannot tolerate interference in the GHz channel. They can't even tolerate the threat of it. The thought it could happen is not tolerable. – Joy Ditto, chief executive of the Utilities Technology Council. "We think it's going to be very hard to dissuade the FCC from taking the action," she told E&E News. The 6-GHz spectrum segment, a prime part of the FCC's initiative, is expected to get a lot more crowded. 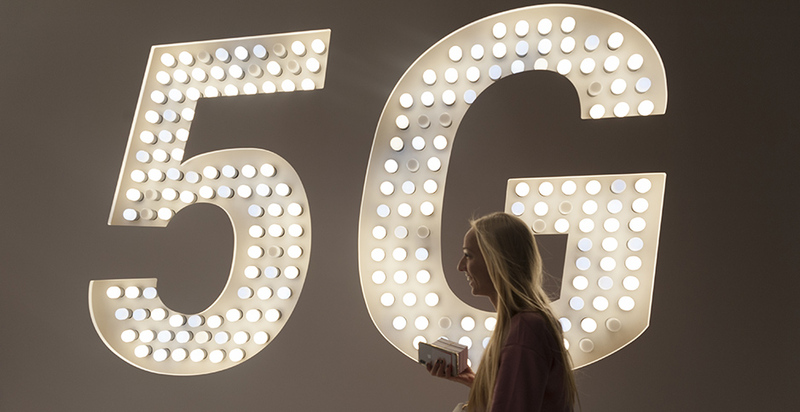 Verizon, AT&T and other telecom companies have begun installing the antennas and backbone networks for 5G Wi-Fi offerings, and next year the rollout arrives in full. 5G technology allows data to move more than 100 times faster than the current 4G internet platform. That will be fast enough, for example, for gamers to shoot their way through "Fortnite Battle Royale" on their phones in real time with no upload delays while a computer drives the car, as the Digital Trends website predicted. It's not just entertainment. Cisco predicts the fastest growth in 5G wireless use will happen in hospitals and health care facilities. And untold other wonders of 21st-century communications are on the way. "The commission's action on 6 GHz comes at a critical time — an inflection point," the tech companies told FCC. Mushrooming demand for unlicensed spectrum — the kind most consumers use for their wireless broadband connections — cannot be met with current allocations. "The commission has correctly concluded ... that unlicensed technologies are indispensable for American consumers and businesses," Apple and its allies said in a joint filing. But there are other inflection points. The installation of a 5G transmission backbone is entangled in a high-level dispute between the U.S. government and China's Huawei Technologies Co. Ltd., which is a global leader in 5G equipment. Congress last year banned government agencies and contractors from using Huawei components in sensitive operations. Last month, Vice President Mike Pence urged U.S. allies to reject Huawei products as security threats. Jeanette Manfra, assistant director for cybersecurity in the Department of Homeland Security's Cybersecurity and Infrastructure Security Agency (CISA), said on the sidelines of the RSA security conference earlier this month that the agency is looking into risks tied to 5G equipment. The review would presumably directly confront the Huawei controversy. "One of the key priorities is the strategic risk assessment of 5G," said Chris Krebs, director of DHS’s CISA. "My main concern right now is that we haven't scoped [out] the conversation, at least in Washington, D.C."
Huawei executives have denied their equipment poses cyberthreats and have sought to include the issue in the trade negotiations between China and the United States. Another inflection point is energy technology. The operation of the nation's utilities is becoming more complicated as they use more renewable energy generation and consumers put solar panels on roofs. Advances in computing power and software also create new applications for electricity consumers. That obliges utilities to respond. Those applications become appendages to the utilities' networks. They expand the volumes of data flowing between utilities and their customers and expand the risks of a cyberattack. Cyber risk increases the need for utilities to control their communications channels. "The reason why we have a cybersecurity risk in the first place is because we're using communications technology on the grid," Ditto said. More than 70 million U.S. households — nearly half the total — have smart electric meters that can "talk" to utilities, and behind them are coming smart thermostats and appliances, security systems, and steadily multiplying charging stations for electric vehicles in homes and "smart" office buildings. The applications spell an upheaval for the comparatively static operation of power grids. Where human operators typically had up to five minutes to bring the grid back after disruptions, experts say computers responding to artificial intelligence algorithms today will make decisions in milliseconds. Technology advances have created a catalog of new digital grid control devices, including "reclosers" that isolate areas of a community that have lost power in a storm, for example, rerouting electricity around the trouble spots, notes consultant Douglas McGinnis of Red Rose Telecom. McGinnis' paper, commissioned by the Utilities Technology Council, was submitted to FCC. Transmission companies are installing relays in substations that connect to both ends of a transmission line, McGinnis noted. If a storm takes down a high-voltage power line, the relays can open circuit breakers on both ends, cutting off power. But the relays must act in unison, in fractions of a second, McGinnis said. If one of the relays doesn't open in time, "in addition to transformers catching fire or worse, the utility's overall transmission system can become unstable and cause possible blackout scenarios." Ditto put more plainly the concern about interference with utility communications. "Our members have said they cannot tolerate interference in the gigahertz channel," Ditto said. "They can't even tolerate the threat of it. The thought it could happen is not tolerable." FCC says new unlicensed Wi-Fi service can coexist with the utilities without the interference issue. "The FCC is looking for a way to allow these services to coexist," said Doug Brake, director of broadband and spectrum policy at the Information Technology and Innovation Foundation, a nonpartisan think tank. From a risk analysis sense, how likely is the interference to happen? That might be quite low. It's a common tactic before the FCC, to bring a worst-case scenario. A new service seeking to set up its wireless network would have to confirm that a utility's communications channel would not be threatened, and then it could determine which channels were safe to use, he said. "From a risk analysis sense, how likely is the interference to happen? That might be quite low. It's a common tactic before the FCC, to bring a worst-case scenario," Brake said. "But, even if the risk is low, the potential for interference would be a very bad outcome." He believes there are solutions that will permit utilities and technology companies to share the 6-GHz space. Ditto has asked members of Congress to lean on FCC to agree to a technical review with the Federal Energy Regulatory Commission to get a common understanding of threats and solutions to the competition for wireless channels. "I think maybe there's informal discussions that occur between the two agencies," she told a congressional committee last year. "But to my knowledge, there is no formal venue for those discussions at least in recent memory." FERC confirms the two staffs are in contact. FCC has other opportunities to create channels for 5G and for critical utility communications. Schwartz's company, pdvWireless, won a commission endorsement last week of its plan to consolidate pieces of the 900-megahertz narrow-band spectrum it owns into larger broadband segments that it would sell to energy companies seeking space for high-speed operations communications. Realigning the band would create opportunities to "fully support critical communications systems," FCC said. FCC commissioners approved a notice of proposed rulemaking to adopt the plan. In the bigger picture, the electricity sector's concerns about its communications networks go beyond security, experts say. The possibility of a wholesale shift of motoring in America from gasoline-driven to electric is the power industry's bright dream. The Electric Power Research Institute estimates that steady growth in electric vehicle sales and home heating electrification could push overall U.S. electricity demand up 24 percent to 52 percent cumulatively by 2050. Without those drivers, utility output would shrink, EPRI said. As much as 90 percent of EV charging will take place at home, the Brattle Group projects, creating an enormous jump in data flowing between customers and utility control centers. But this future won't be handed to utilities. They will need to expand their communications networks to realize it, said a Navigant Consulting Inc. study. "As storm severity continues to grow and other disasters such as drought and wildfires become more common, regulatory bodies, grid operators, and power balancing authorities nationwide will be under increasing pressure to improve grid resilience," according to Navigant. "This cannot be achieved without a robust communications infrastructure — infrastructure that, to be most effective, should be standardized and interoperable across utility and state boundaries for ease of support and mutual aid in times of crisis." Customers will demand new programs to help them reduce energy use and reduce dependence on fossil fuels for electricity. "If utilities do not meet these expectations, providers such as Google or Amazon very well might," Navigant said.